Purchase any AHP monograph as a printed document or searchable PDF. To order a monograph, click on Order Monographs tab, Choose the alpha grouping options listed, scroll down to your monograph choice and click on the Pricing tab. You will then be taken to our secure online shopping cart. Please note: We are working on a new commerce system that will give you immediate and secure access to the digital monographs you purchase through AHP’s website. Until that system is implemented, AHP will email your PDF or US Post Mail your hard copy during regular business hours. Hawthorn (Crataegus monogyna, C. laevigata) is by far the most widely used botanical for supporting a healthy cardiovascular system. It has been used for several hundred years for this purpose and it possesses among the most broad-spectrum activity beneficial to the heart, including antioxidant, positive inotropic, chronotropic, circulatory, and blood-pressure-lowering activity. It is also among the safest of cardioactive herbs. In addition to its effects on the heart and circulatory system, hawthorn is effective for relieving anxiety and is a remarkably effective sleep aid, especially for relieving anxiety in children. In addition to the two species primarily covered, in practice and in trade, several species are acceptable for use as hawthorn. 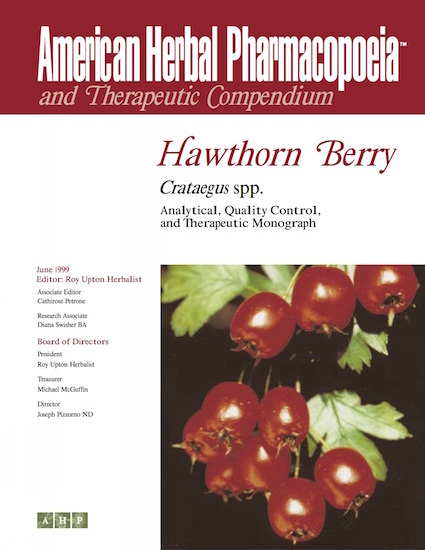 While the berry is used in Western herbal traditions, the leaf and flower have been subject to numerous clinical trials demonstrating the usefulness of hawthorn leaf and flower extract in the management of congestive heart failure. PDF orders will be emailed within one working day except on weekends, and then on the following Monday. 2-3 day domestic US mail Priority is used for shipping hard copies. INTERNATIONAL and CANADIAN ORDERS! PLEASE CLICK ON THE DOMESTIC SHIPPING ARROW AND CHOOSE INTERNATIONAL SHIPPING, OR YOUR ORDER WILL BE DELAYED. International shipping is 6-10 days. AHPA and AHP Members please call or email your order to get 10% off!